Catalog Page 55. Hats for teddy bears and stuffed animals. Catalog Page 55. Hats and accessories. 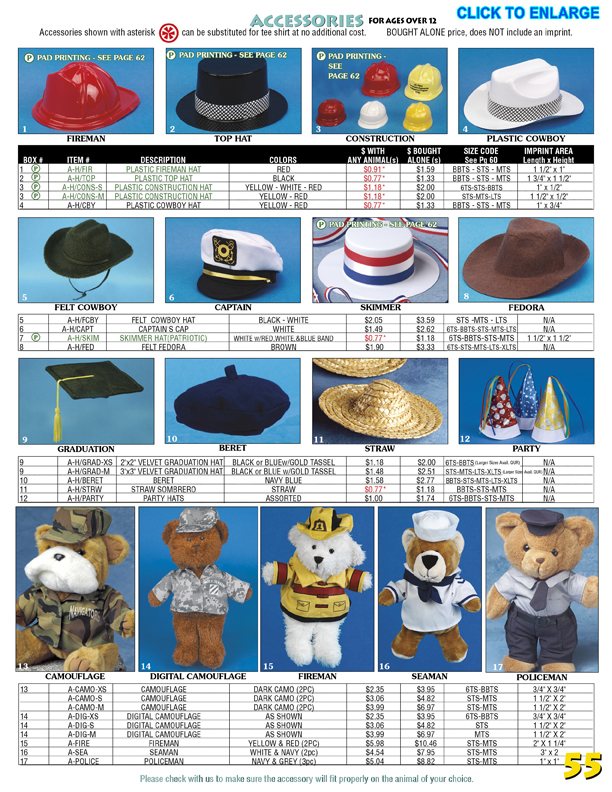 We offer many styles of hats for our teddy bears and stuffed animals. Hats can help to personalized a theme for a low cost. Add a captain's hat for a sailing theme or a skimmer for a political theme. This page includes the following hats: fireman's helmet, top hat, construction helmets, cowboy hats, sailor hats, skimmers, fedora, graduation hat (black or blue), ranger hat, beret, witch, straw hats, sombreros and party hats. The hats are available is a variety of sizes to fit most bears. The size code can be used to determine if a hat will fit your teddy bear. Police bears are great for promoting your police department or special event. Police departments provide the bears to children. Cheerleader bears are popular for school fundraising events. Army bears can be personalized using our camouflage uniforms or a personalized t-shirt. Army bears are popular for military bases and army themed parties.